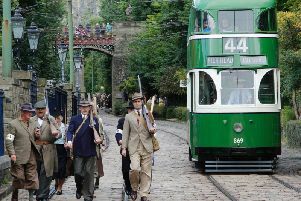 Step back in time and experience the nostalgia of the Edwardian period at Crich Tramway Museum this weekend. As well as vintage trams from the era running daily, there will be a programme of events including re-enactor scenarios from Echoes of a Gilded Age with street scenes and vignettes. Theatre Company, Don’t Go Into The Cellar! will perform: Old Haunts: Ghostly Tales of Edwardian Menace by M.R. James on Friday and The Singular Exploits of Sherlock Holmes on Sunday, which features the great detective recounting highlights of his crime-busting career. On the Friday,the museum’s 1874 Horse Tram will be in operation, offering rides from11am to 1pm and from 2pm – 4pm. Old Time Music Hall performances can be enjoyed each day. On Sunday there will be the chance for families to play with and make Edwardian toys, and Crich Brass Band will provide the music from 2pm -3pm.